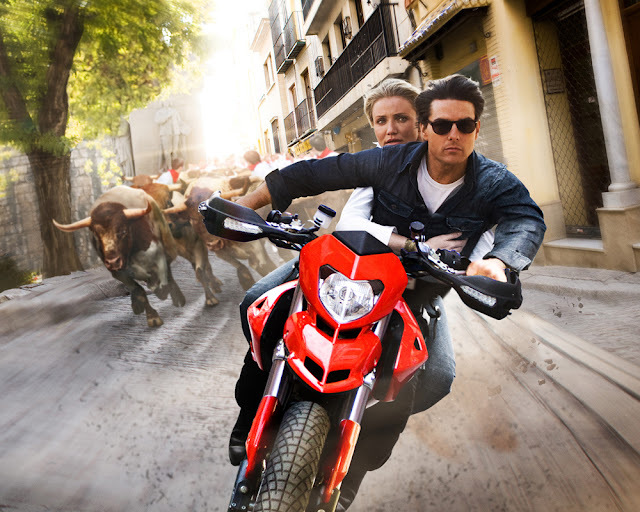 20th Century Fox releases the latest trailer of “Knight and Day” that tracks Tom Cruise and Cameron Diaz in a superlative of stunts as they play a fugitive couple racing across the globe. “Knight and Day” was briefly introduced to the movie viewing public months back when its first trailer played in theaters and on the blogosphere depicting Tom Cruise as a mysterious man clad in jeans, shirt and a jacket stalking the panic-stricken Cameron Diaz who had been thrown in a cycle of cutthroat events that threaten her life. An action-comedy that begins when a small-town woman (diaz) has a chance encounter with a mysterious man (cruise). He is either the man of her dreams or perhaps, her nightmares. Also starring in “Knight and Day” are Peter Sarsgaard (“An Education”) as a federal agent relentlessly pursuing the couple; Viola Davis (“Doubt”) as a CIA director trying to decipher the true purpose of their high-wire activities; Paul Dano (“There Will Be Blood”) as an eccentric genius behind a revolutionary technology; and Olivier Martinez (“Unfaithful”) as a ruthless arms manufacturer. Co-starring are Maggie Grace (“Taken”) and Marc Blucas (“Buffy the Vampire Slayer”). “Knight and Day” opens in the Philippines on July 7 from 20th Century Fox to be distributed by Warner Bros.